A moose got trapped in a frozen river in Örnsköldsvik, Sweden on Feb. 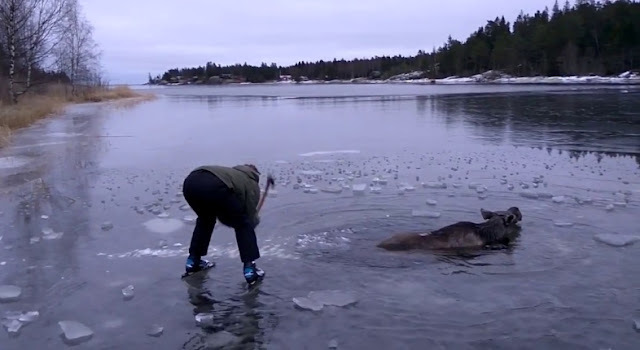 These people were able to help the moose make its way back to land using an axe and an ice pick. Winter can be a beautiful time of the year. From sledding and skiing to hot cocoa, there are many ways to celebrate the cooler months. But for our animal friends, winter can be very dangerous and sometimes they need a helping hand. Moose hair is hollow. This type of fur helps to insulate the animal from the cold. A moose's front legs are longer than its back legs. This helps the moose more easily jump over things lying in its path. The hump on a moose's back is caused by massive shoulder muscles. The flap of skin that hangs below a moose's chin is called a bell, according to National Geographic. A moose's wide hooves act like built-in snowshoes, helping the moose walk in the snow. Moose can run 35 mph (56 km/h) over short distances and trot at 20 mph (32 km/h) for longer periods. Moose are strong swimmers and can swim up to 6 mph (9.5 km/h) and as far as 12.4 miles (20 km). Moose can also stay under water for 30 seconds when swimming. Responses to "Brave People Venture Out Onto Frozen Lake to Rescue Trapped Moose"